Thanks to "Black Panther," "A Quiet Place," and "Crazy Rich Asians," a USC report finds that women were box office gold last year. Time’s Up has a reason to celebrate: The number of top-grossing movies with women as central characters took a huge jump in 2018. 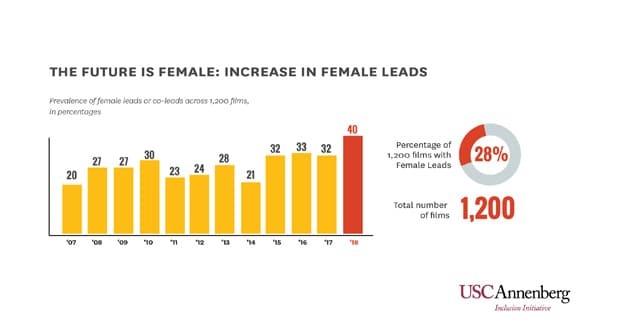 According to a study by USC’s Annenberg Inclusion Initiative, women were main characters or co-leads in 40 of the top 100 grossing movies of 2018. This marks the highest percentage of female driven films in 12 years, an increase in eight movies from the previous year. This means studios are finally backing more movies led by women — and finally listening to public opinion. The news comes after years of mounting pressure from groups such as Time’s Up for Hollywood to improve its representation of women and people of color. The blockbuster success of “Black Panther,” “A Quiet Place,” and “Crazy Rich Asians” proved audiences are hungry for greater diversity as well. Although white actresses still outnumber actresses from underrepresented groups, the study suggests things are steadily improving. According to the report, 28 of the top 100 movies of 2018 featured an underrepresented lead or co-lead. That’s an increase of seven films from 2017 and 15 from 2007. Last year, five black or African-American actresses had lead or co-lead roles, three mixed-race actresses had lead or co-lead roles, two Hispanic or Latina actresses had lead or co-lead roles, and one Asian or Asian-American actress had a lead role. No Native women or women of Middle Eastern descent had leading roles. The numbers improved for older actresses as well. Thanks to films like “Ocean’s 8” and “Halloween,” eleven of the 100 top grossing movies featured a female lead or co-lead 45 years of age or older. That’s a vast improvement from 2017, which saw a female lead who was 45 or older in only five of the top-grossing films. The study found that each of the seven major studios had at least one woman of color in a leading role in 2018. 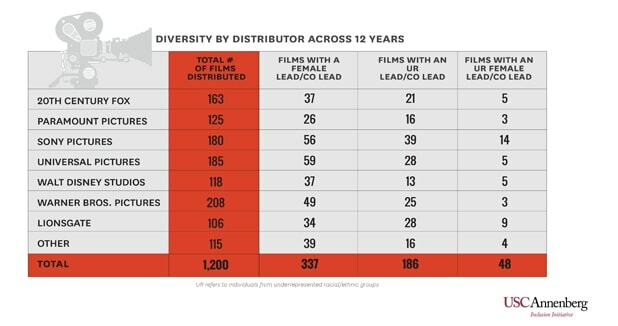 Over the last 12 years, Universal and Sony produced the highest number of films with women leads or co-leads. Sony was the top producer of movies led by both women and men from underrepresented groups.